In mixed-line-rate (MLR) networks, different line rates on different wavelengths can coexist on the same fiber. MLR architectures can be built over transparent optical networks, where the transmitted signals remain in the optical domain along the entire path. 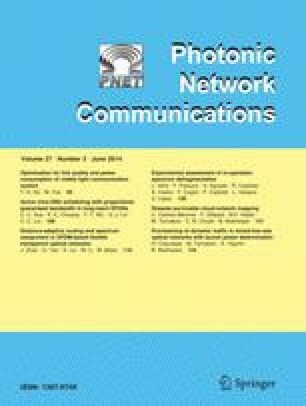 Along the transparent optical path, a signal experiences various physical layer impairments (PLIs), and its quality degrades as it travels through each optical component. One of the major factors that affect the transmission quality is the launch power of the optical signal. The power must be large enough to ensure noise resiliency at the receiver, but it must be below the limit where fiber nonlinearities distort the signal. Moreover, high launch power is disruptive not only for the actual lightpath itself but also for neighboring lightpaths, and this effect is particularly critical in MLR networks since advanced modulation techniques used for high line rates are highly susceptible to PLIs. In this study, we investigate the problem of determining the appropriate launch power for provisioning of dynamic connection requests in MLR networks. By setting the appropriate launch power for each connection, we aim to maximize the number of established connections. We propose two different heuristics to determine the appropriate launch power of a lightpath. Worst-case best-case average (WBA) is based on optical reach of signal in a transparent optical network. In impairment-aware launch power determination (I-ALPD), current state of the network and impairments are evaluated to determine the launch power. The proposed approaches are practical and can adapt to the needs of network operators. Simulation results show that the performances of the proposed approaches show better results than the existing schemes in terms of blocking probability and bandwidth blocking ratio. This study is partly supported by The Scientific and Technology Research Council of Turkey.